This post will go into great detail about some of the characters in the book, their motives and such, but not any plot developments. I wouldn't call any of my observations spoilers as such; but the post would probably be more interesting to someone who has read the book. "If you don’t understand, ask questions. If you’re uncomfortable about asking questions, say you are uncomfortable about asking questions and then ask anyway. It’s easy to tell when a question is coming from a good place. Then listen some more. Sometimes people just want to feel heard. Here’s to possibilities of friendship and connection and understanding." - an extract from the blog "Raceteenth Or Various Observations About American Blacks (Those Formerly Known as Negroes) by a Non-American Black", featured in this book. It is impossible to start this post without linking to the Danger of A Single Story TED Talk by Adichie which, even after watching it a zillion times over, doesn't fail to amaze/inspire me. This TED talk is the reason I wanted to read Americanah and part of the reason I was convinced I would love it. 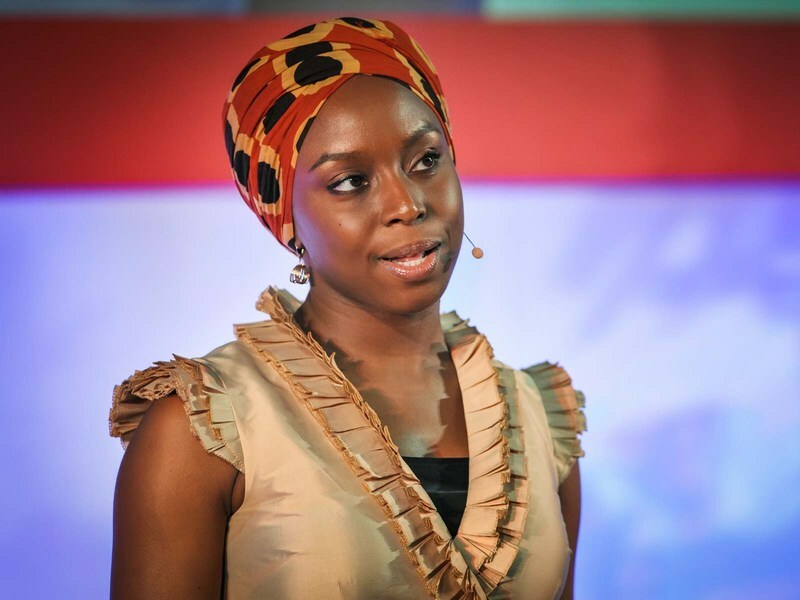 Chimamanda Ngozi Adichie was born in Nigeria, the fifth of six children. In the talk, she describes having spent her childhood in a typical middle class Nigerian family. She grew up on a university campus where her parents worked and was an early voracious reader. She studied medicine at the University of Nigeria and moved to the U.S. at the age of nineteen. After spending four years in the States alone, she went back to Nigeria, and has since split her time between both the places. I tell you all this because Americanah, at a first glance, seems like a semi-autobiographical story. Ifemelu has lived in America for thirteen years and is making plans now to return to her home country. But she has been away too long and a lot has changed. As a young girl, Ifemelu had not been attracted to the idea of America. Her fascination with it developed as a teenager in a Lagos school, through her friend and lover, Obinze - a professor's son who thrived on American books, movies and music. When Ifemelu had moved to the US to study, Obinze planned to join her. But he never made it. 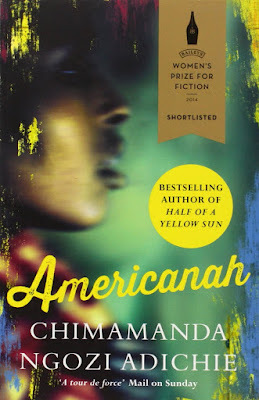 Chimamanda Ngozi Adichie weaves a seamless saga, a book that is not limited by one topic or intended audience. No emotion is diluted, there is no forced subtlety. It is a story steeped in culture and were I asked to grind its theme down to one thing, I would say it is about human interaction. Over and over, it deals with our constant, often unconscious, attempts to redefine our identity to suit the cultural context we are cocooned in. Ifemelu is an eminently unlikable character, because she is un-rooted. She tries on identities like clothes and casts them aside with apparent ease, without noticing and for the longest while, letting us notice, the toll it takes on her. With a white boyfriend, she plays the role of the exotic black woman. With her black American professor friends, she attempts to be an intellectual. Even her carefully constructed online persona is just that - constructed. For Ifemelu, it was only with Obinze that she never bothered to be anything, and just was. And in the midst of every great upheaval of her life, she finds herself craving that comfort of being true to herself. The story is peppered with an amazing array of characters. One of my favourite people in Ifemelu's American life was her cousin, Dike, the product of her Aunty's affair with a rich officer back in Nigeria. Ifemelu is often shown to be puzzled by, even a little derisive of, the change her aunt undergoes after moving to America, where she adopts what Ifemelu and Obinze term an exaggerated sense of gratitude. "“Dike, put it back,” Aunty Uju said, with the nasal, sliding accent she put on when she spoke to white Americans, in the presence of white Americans, in the hearing of white Americans. Pooh-reet-back. And with the accent emerged a new persona, apologetic and self-abasing. Sometimes, while having a conversation, it would occur to Ifemelu that Aunty Uju had deliberately left behind something of herself, something essential, in a distant and forgotten place." But the exact effect that immigration has on Dike, a baby at the time of his arrival, is lost on Ifemelu. She is a child of Africa, raised without the concept of race. Dike, on the other hand, has race and colour woven into his identity. In spite of being an easygoing and altogether popular boy in his school, Dike does face bits of unfair aggression. But he trains himself to laugh it off - a camp teacher who assumes he wouldn't need sunscreen, for instance. What I love about the character of Dike is the interesting juxtaposition of his relation with Ifemelu versus her interaction with the rest of her American mates. For all the superior conviction with which Ifemelu blogs her mini theses on racial identity, interactions with Dike leave her puzzled and helpless. Her failing lies perhaps in considering him more Nigerian than American, like herself. Throughout the book, her African Americans friends call out her ability to write about race successfully as a luxury that she can afford because she was not born on the receiving end of racial prejudice. If she were a black American and wrote what she wrote, she would naturally, they say, be called dramatic and shunned. Ifemelu often bristles at such pronouncements, but her repeated inability to understand Dike's point of view, his inner struggle, shows that such judgments are truer than she would care to accept. Race is a complex issue and there does not exist a singular definition of oppression or racial identity. Through endless examples, Ifemelu stresses on this. There is no united league of the oppressed, but it is somehow worse to be black. Popular media tries to serve us a single story of racism; and popular opinion tries to convince itself that that story no longer exists - that 'proper' racism is mostly gone. “In America, racism exists but racists are all gone. Racists belong to the past. Racists are the thin-lipped mean white people in the movies about the civil rights era. Obinze's character and his story add an honest charm to the book. His perspective is most interesting in contrast to hers because he is as grounded in his identity as she is not. His suffering, his struggle comes not from inside as hers, but from his inability to fit in with those around him, to be what he is expected to be in changing surrounding, to construct himself a fitting persona. His straightforward simplicity reminded me absurdly, randomly, of Konstantin Levin from Anna Karenina - though why they should seem similar I haven't given a thought. Obinze's was the character that really propelled me to keep on reading the book, whom I was invested in... I wanted to know what would happen with him. Even his experience with class prejudice somehow hit closer home that many of Ifemelu's experiences. There were times when the story lines felt a little maudlin, somewhat prone to cliches. And it perhaps could have been a shorter book, but finding faults in the book has proved to be a needles-in-a-haystack task for me. I loved it. I cannot imagine anyone not loving it. You know, I'm technically brown-skinned, but I'd find it funny to call myself a person of colour. I've never lived outside India, that may be why (which is not to say we don't have any racism within)... even so, I understand, at least in part, the absence of the idea of race in the mind of a person of colour. I kind of liked how unapologetic-ally African the names of the characters were, and that they came with no directions on how they were to be pronounced. I learnt a great many new things about African culture. There is something that I forgot to mention in the rest of the review that deserves to be here, so I will add it to this paragraph of miscellaneous unsorted final thoughts - the language, the language, the language! Adichie's lines are precise, cutting and just divine. My sister, who raced through the book in the span of a day probably, said the book was impactful (not verbatim), that she did love it, but it did not not make any groundbreaking observation. This is true. But it did have dollops of wisdom delivered in a way that made me think - I have always known this, I just didn't know that I knew it. And one of the great pleasures of reading, to me, is to find instinctive convictions and passing observations of mine put rather gloriously into words.